The Steering Committee supports and supervises the implementation of the Programme by giving general direction, advice and feedback on already implemented actions. 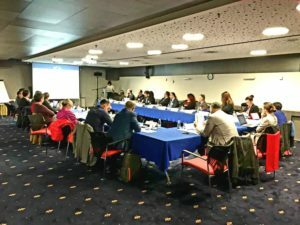 The Steering Committee is set up with two representatives from each partner country and implemented in cooperaton with the Joint Research Centre (JRC) and the Disaster Prepardness and Prevention Initiative for South Eastern Europe (DPPI SEE). The meeting is chaired by the Programme Director and DG ECHO representative and include s consortium members and key stakeholdes whose expertise is felt relevant to the Programme’s implementation. Organized with the kind support of the Ministry of Security BIH at the Hotel Europe in the heart of the city, the meeting was the occasion to present, discuss and adopt the partner-specific plans of actions and to see possible regional commonalities and synergies to bring forward to the creation of the regional road map. 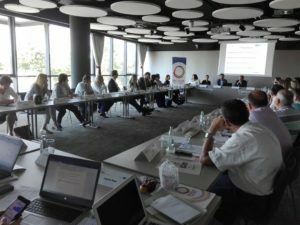 It was held in connection with the Disaster Preparedness and Prevention Initiative for South Eastern Europe DPPI regional meeting. Other themes included the IPA DRAM Action plan, the role of Gender equality in Human Security and natural disasters, IT systems and platforms to implement during the next two years – with a special focus on the ERRA portal.